A shovel is a tool for the ages…and camping. This old-age tool has ingenious uses for campers, no matter the types of camping they partake in. Shovels can be used to dig a fire pit, so you can learn how to build and start a campfire, and they are a helpful tip to campfire safety. They can also bury a left-over meal from camping kitchens, and dig a trench to redirect rainwater away from the campsite. A shovel can be an excellent survival gear and tool for outdoor adventurers and can even help in emergency situations. Modern shovel designs are compact to ensure that they can be easily taken on a camping trip. Our list of the 10 Best Folding Shovels in 2018 delivers the best folding shovels for all your outdoor activities. 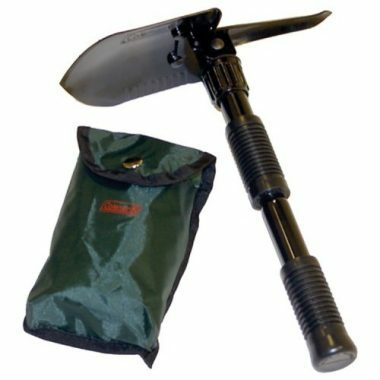 This Military Entrenching Shovel by AMES is a collapsible shovel that features a steel blade and aluminum handle. 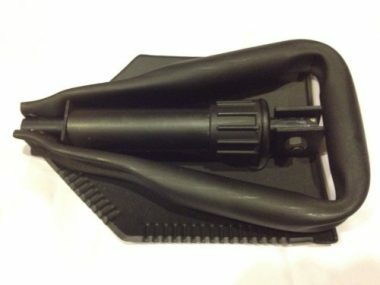 This survival shovel has a tri-fold design that collapses for easy carrying and storage. There is a sharpened axe and serrated saw edge for multi-purpose use. This entrenching shovel is a genuine US military issue that can stand up to the most rugged tasks. 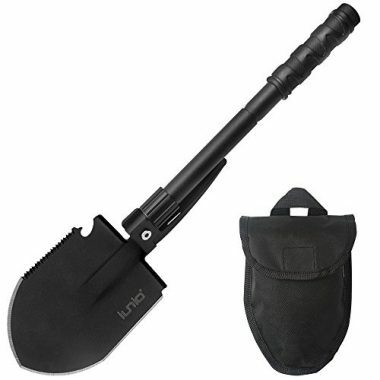 This Military Folding Shovel by IUNIO features a compact design that has added features like a saw, bottle opener, nail extractor, emergency whistle, and compass. This survival shovel is an all in one tool that is multifunctional for all your camping needs. The handle and blade are made of high carbon steel and there is a rubber grip. The shovel folds up and fits into its provided carrying pouch with ease. This Foldable Survival Shovel by SOG features an extremely compact design that has a wood saw and rotating spade blade for use as a pick or hoe. This shovel has a 3-way folding design that reduces the bulk and makes it extremely portable. The shovel is made of high carbon steel and comes with a carrying case. The Gorge Folding Shovel by Gerber is a compact shovel that has an easy push button slide mechanism in the design to extend the device. This folding shovel has a blade made of carbon steel and a glass-filled nylon handle and rubberized grip. The handle of this shovel also has a hammer mode for pounding in your tent stakes. The shovel also comes with a drawstring bag for storage. This Multitool Folding Shovel by FiveJoy is a top rated folding shovel that has many added features. This all-in-one survival shovel can be used to cut materials, dig trenches, start fires, and signal an alarm. The shovel is compact and lightweight for easy portability. The folding shovel is made of carbon steel and is virtually indestructible. This E-Tool Folding Spade by Gerber has a lightweight and tough design. The shaft is anodized and durable for heavy-duty use. There are serrated edges on the blade for extra power in tough environments. The shovel locks when open to prevent an accidental collapse. 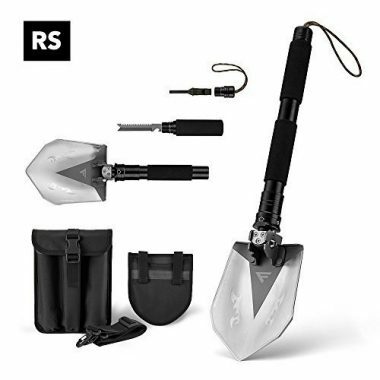 This Entrenching Tool by Glock is a multifunctional folding shovel. This entrenching shovel is lockable in four positions and weighs half the weight of most shovels. There is a telescopic handle that is made of high-impact resistant material. This compact shovel is built for endurance. The Survival Folding Shovel by Fobachi is a multi-function design that can be used for cutting, digging, and picking. 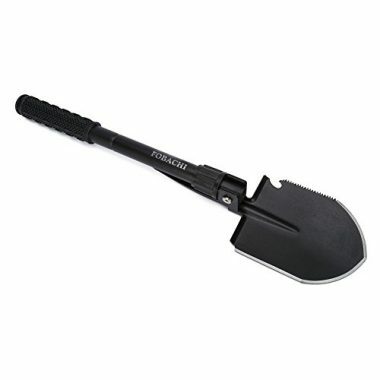 This survival shovel is made of high carbon steel and has a soft rubber grip. This is a military original tool that can be used straight or at 90 degrees. It also comes with a carrying pouch. This Folding Shovel with Pick by Coleman features a forged steel design for a guaranteed long life. This camping folding shovel can be uses as a pick, shovel, or saw. This hiking shovel is compact and locks into place. There is also a carrying pouch included. 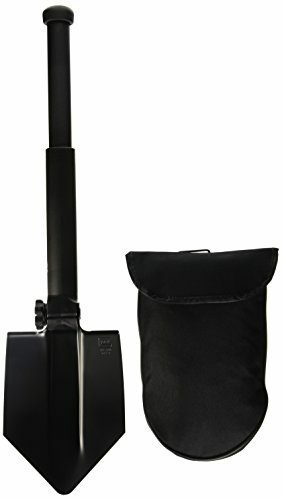 This Folding Entrenching Shovel by VIVO is perfect for emergency situations. This shovel can be used and locked into place at 180 degrees or 90 degrees for difficult situations. 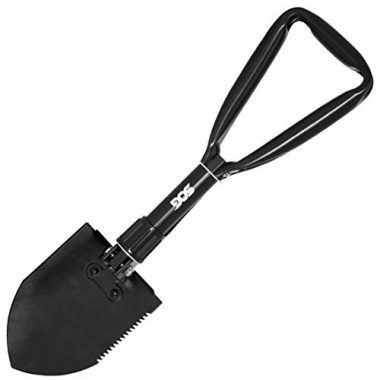 This entrenching shovel has a fine black finish and is compact in its design. The shovel collapses easily into a provided carrying bag. When it comes to choosing the best folding shovel, there are many different designs and features for you to choose from. The best folding shovel will deliver a durable body and compact design that can be used throughout multiple camping trips. Even if you are car camping, a shovel can be a useful tool and is useful car camping gear. It is important that you invest in a folding shovel that is high-quality in its build and construction. The blade of your shovel should be made of one solid piece, rather than sheets, and be anti-corrosive. The handle should be made of a durable material and connected to the blade with a hinge, which makes the design a folding shovel. You want the shovel to be durable so that it won’t dent. If you accidentally hit a rock while digging, your shovel shouldn’t dent, chip, or break. The best camping shovel will be made out of a durable material. Common materials that are long-lasting used for the shovel blades are stainless steel or high carbon steel. Most of the metal will then be coated with a black oxide paint to help prevent corrosion. The handle should be made of a metal or hard plastic, to ensure it is durable too. There are three designs that are popular for a folding shovel. The first is a tri-fold shovel, where the blade and grip can be folded down. The second is a two-piece folding shovel, which is standard. A two-piece folding shovel will have one hinge to fold the shovel into a compact design. The third is a telescoping design that extends and collapses the handle to save space and make it portable. It is important that your folding shovel is portable. The most portable folding shovels will be durable, lightweight, and compact. An all metal handle might be heavier, but if it comes with a good compact design, it can be worth the extra pounds because it will be durable and long-lasting. Shovels that are made of lighter and less expensive materials tend to not last very long. 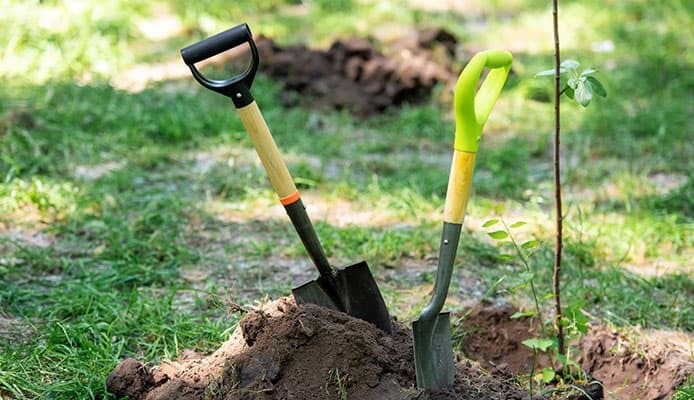 A folding shovel should be easy to use, but there are certain features that can make them easier to handle and operate. Shovels that have a D or T grip handle tend to provide extra support, over a straight handle design. Adjustable shovel handles may help prevent you from having to bend down too much. 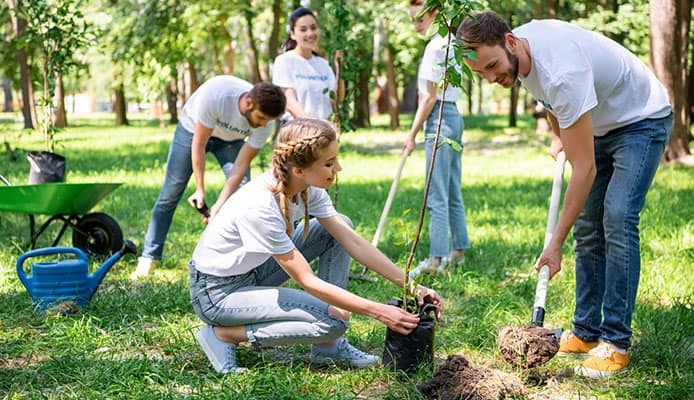 You should consider different features and determine whether they would make your folding shovel easier to use and benefit your needs. Most shovels are used for digging, but some manufacturer’s include extras like a sawing capability in their design. Other shovels have a multi-tool, or a compass included in the design. You shouldn’t spend money on extra features if you know you won’t put them to use but consider them if you want a few added extras in your folding shovel. There are many different sizes, but the best folding shovel will be small and compact. You should find a design that balances a decent sized blade, so you can get the job done, in a compact design so it can be easily transported. The best folding shovel will be lightweight. You shouldn’t have to carry around a lot of weight. You should find a design that is durable, but lightweight. However, be prepared to sacrifice saving some weight for a truly durable and long-lasting folding shovel. If you want more out of a shovel, you should consider a folding shovel design that can be used as a saw and axe too. Some folding shovels feature the ability to saw or cut through various materials, so you can carry less tools. As well, a shovel can be used to start a fire and dig a small hole that you can use fire starters to get a flame ignited. Or a shovel can be useful to help pound in your tent stakes, eliminating the need for a hammer or trying to use a rock. As well, essential wild camping guides will tell you shovels are key to personal hygiene while camping and backpacking. If you are camping with beginners, you can teach them the important leave no trace principles to ensure the trails stay garbage free. The handle should be made of a durable metal or plastic because it will bear a lot of force. It would be frustrating to have a handle snap on your trip, so ensure that you have a strong one to get the job done. Folding shovels do a lot of hard work. For that reason, finding a durable design is extremely important. Your shovel shouldn’t be a one-time use tool. The best folding shovel will last your throughout multiple trips, while still delivering high-performance. You should invest in a carrying case, if your shovel does not automatically come with one. A carrying case can help you pack your shovel easier and help protect it. Most importantly, a good carrying case can prevent water damage, which stops the possibility of rust developing. Q: How to care for my folding shovel? A: Water is the enemy to your folding shovel. Water can lead to rust, which can make your shovel hard to use and prone to breakage. The best way to care for your shovel is to always clean it after every use and ensure that it is store bone dry. Q: Can I get my shape sharpened? A: Yes. Your shovel should be able to be re-sharpened by yourself or a professional. The best you can do is reference the user’s manual for information regarding sharpening. Q: What should I do if I can’t fold and unfold my shovel? A: This is most likely due to damage or rust, but it could also be a design flaw. To defeat the rust, you can try to put some oil on the hinge to loosen it up. You should ensure that your shovel is clean and dry when stored. If it is a manufacturer’s issue, check to see if you have a warranty. Q: What are the benefits of using a folding shovel? A: A folding shovel can be used for a variety of tasks around the campsite. 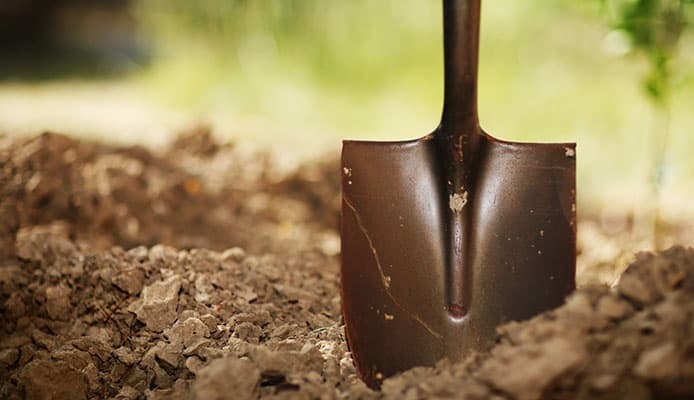 From digging small or large holes to full trenches, a folding shovel may be able to save you in unexpected situations. A shovel can also be used for other tasks like cutting and chopping. A folding shovel really is a great multi-use camping tool. The best folding shovel will make life at your campsite easier and can be essential to set up a campsite. No matter the style of folding shovel, you should feel confident that you have such a versatile tool at your fingertips. 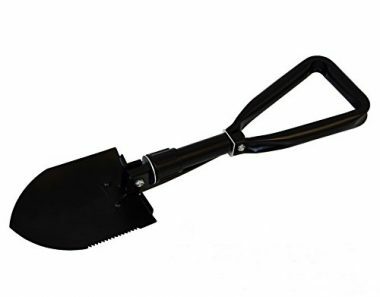 If you know exactly what you want or need, you can save time and money by investing in a top rated folding shovel. Do you own one of the folding shovels that made it onto our list? Let us know how it has worked for your outdoor needs in the comments section below.